The popularity of the outdoor living concept in Australia has led to the development of diverse products for the home segment. The Alfresco door range from Polytec, for instance, offers a functional and aesthetic solution for built-in outdoor kitchen cabinetry. Polytec has now updated the Alfresco palette with the addition of six new Woodmatt colours alongside two new Matt finish colours. The Matt finish embossed wood grain prints utilise natural timber technology advancements to match authentic timber veneer in look, feel and warmth. 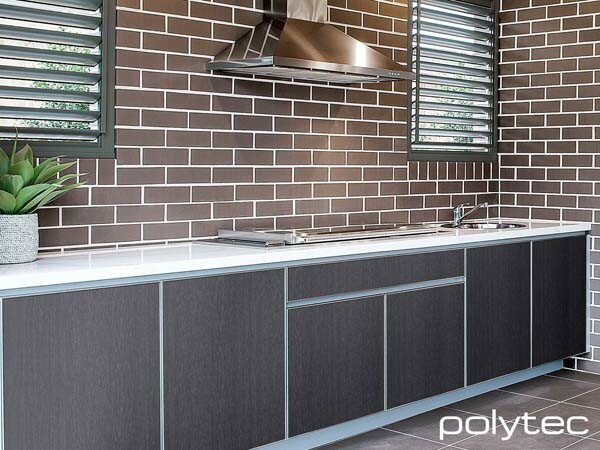 All the new colours are also available in Polytec’s melamine doors and panels as well as benchtops and laminates, allowing homeowners to design alfresco kitchens as a natural extension of their indoor kitchens. The new colours include Cinder Matt, Stone Grey Matt, Antico Oak Woodmatt, Coastal Oak Woodmatt, Empire Oak Woodmatt, Estella Oak Woodmatt, Notaio Walnut Woodmatt and Prime Oak Woodmatt.